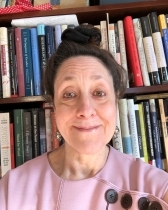 Julia Stern (Ph.D. Columbia, 1991) is Charles Deering McCormick Professor of Teaching Excellence and Professor of English and American Studies. She offers courses in 18th-, 19th-, and early 20th-century American literature, with a focus on women's and African American writing (Rowlandson-Cather; Equiano-Larsen), the sentimental and the gothic, Faulkner, and the films of Bette Davis. Her first book, The Plight of Feeling: Sympathy and Dissent in the Early American Novel (Chicago: 1997) was a finalist for the MLA's Best First Book Prize. Mary Chesnut's Civil War Epic (Chicago: 2010), her second book, is the first full-length literary study of Chesnut's revised Civil War narrative. Currently, she is working on "Bette Davis Black and White," a study of racial representation in Davis's oeuvre. Throughout her career at Northwestern, Stern has been recognized for her teaching, with awards from The Faculty Honor Roll from the Associated Student Government (3 times), the Pan Hellenic Association's Teaching Recognition, Weinberg College's Distinguished Teaching Award, The Charles Deering McCormick Professorship of Teaching Excellence, and the award for Weinberg College's Outstanding Freshman Advisor.